Register before September 4 to receive the early bird special of $200, a savings of $40! Learn the art of intuitive painting and exploring the process of creating rather than only being concerned with the finished product. We will be exploring how to approach the canvas, paint application, mark making, texture choice, warm vs cool colours, colour theory and layering. Learn to listen to your intuition and trust in the creative process, discover what emerges between each layer of paint and bring out what comes naturally. To gain a better understanding of the techniques used with Intuitive Painting, we will go through the process of two different paintings as a group, step by step. Weekly art journal activities will be assigned to allow our creative minds to continue working when not in the studio. Explore the world of mixed media and the endless possibilities it offers through this 6 week course, designed exclusively for teens. Each week students will be introduced to a new medium and create a project using the techniques they are shown. Bring a friend and you both will receive $25 off your admission! Don’t forget to name the person coming with you to the retreat in order to receive your discount. 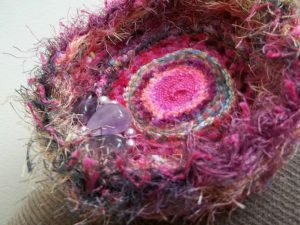 Create a sweet nest woven in the round with a variety of coloured threads and textured yarns. Techniques covered include stringing a round loom, weaving and yarn choices. Complete your nest by adding your own unique design of beads and charms. This workshop is for both beginners and those already familiar with the art of weaving. Techniques from this workshop can be applied to a variety of other weaving projects as well.